There are some really interesting wooden artefacts from the Flag Fen excavations, preserved in the fenny waterlogged deposits. One of these is a scoop, find reference A8458, carved from a piece of willow. It was found in one of the lowest levels of the main excavated area of wooden timbers that make up the post alignment and platform of this major prehistoric site. Associated with Phase 1 structures, it probably dates from around the thirteenth-century BC and is now in the British Museum. Maisie Taylor analysed the wood from the excavations. When describing the scoop she wrote, “The bowl of the scoop was shaped across the grain and so well finished that no clues survive as to the method of fabrication” (Pryor 2001:226). Willow is a fibrous wood with a very open texture. There are many British varieties and it hybridizes very easily. The wood can be cut cleanly, but there is a risk that the fibres will tear out; apart from cricket bats, the most common use of willow is its withies for basketry. With half an eye on the Flag Fen scoop, I’ve been trying out some unseasoned willow that came from a fallen tree in the River Kennet at Lockeridge. The tree fell across the river and was affecting its course, so the landowner cut it up and I was given a few pieces. 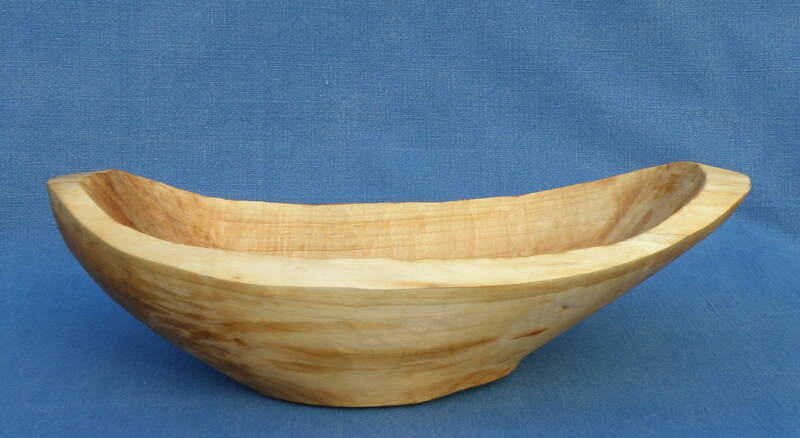 This bowl was very easy to carve, using my small adze and a wide, shallow swept chisel designed for just this work. However, the long, coarse fibres caused problems in the bowl bottom and where the bottom and sides meet as the chisel’s cutting edge went parallel to the grain rather than across it. It will be interesting to compare with the behaviour of seasoned wood. The bowl base is at the centre of the log and the oval form runs parallel with the log. This entry was posted in wood and tagged British Museum, Flag Fen, willow by Katy. Bookmark the permalink.